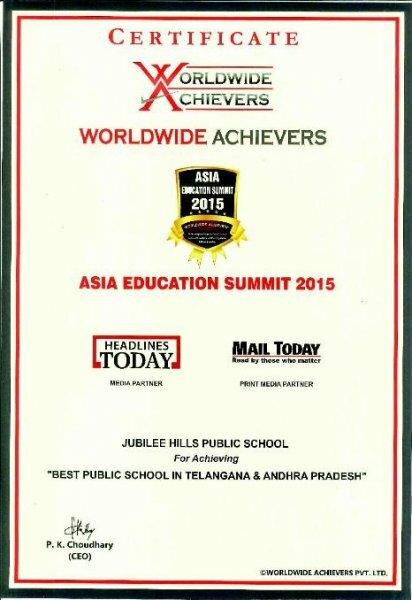 World Wide Achievers has ranked Jubilee Hills Public School as “Best Public School in Telangana & Andhra Pradesh. Jubilee Hills Public School is the proud recipient of a fourth Award “Best School in Andhra Pradesh and Telangana”. The award ceremony was organized in Delhi on 25th March 2015. Ms.G. Sree Devi the Academic Director and Ms. Suneeta Roopchand the Academic Coordinator attended the Awards Ceremony and received the award. The award was received from Mr. Abhinav Bhindra. The Asian Education Summit was constituted by World Wide Achievers to recognise and motivate Educational Institutions which are striving to impart quality education.